Sculptures include a deconstructed lightbox in which a shade printed with the image of a perfect blue sky is illuminated from behind as though by a window. More than an engaging architectural pun, it was inspired by the words of a Swami who believed that if he could roll up the sky like a scroll, he would see the light of truth behind it. “Standing on a Lotus” is a hardened burlap flower form, large enough for the artist to stand on, with a center of comforting fleece-lined slippers, wooden walking sticks, and accessories of fleecy arm and knee pads. It is both a representation of perfection through balance and lightness as well as a mechanism of physical effort. Most of Green’s sculptures are the result of laborintensive hand-crafting, and many are based on the motif of the eternal circle, which both joins and encloses. 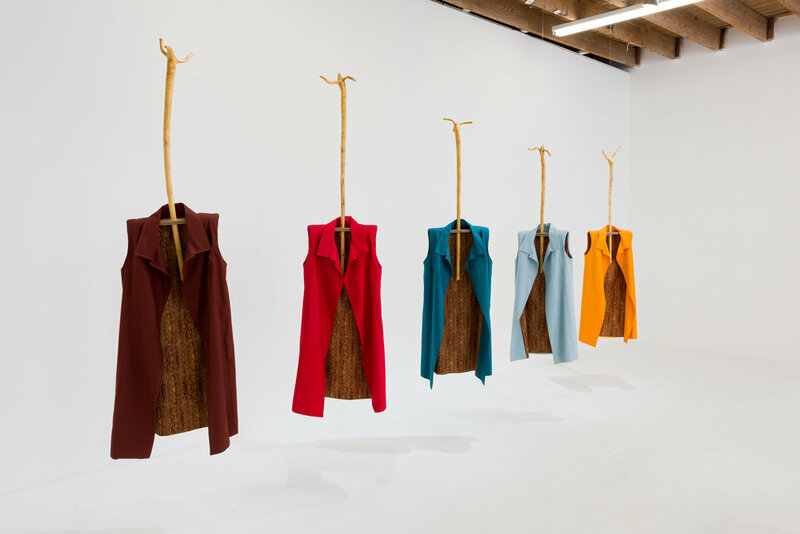 Performative, interactive, tactile, and conceptual, both the sculptures and the clothing involve the presence and participation of the viewer, making it all the stronger in articulating what Green sees as the connection between body and spirit. Saturday, November 18, 2017, 2 - 4 p.m.